The vast Pacific Ocean, the largest body of water on earth, has not diluted the radiation from Fukushima Daiichi nuclear power plant meltdown. Instead, it has become increasingly concentrated as it approaches the West Coast with eventual peak concentrations likely to reach levels up to 10 times higher than off the coast of the rest of Japan. More than 400 tons of radioactive water have been flowing into the Pacific every day since the meltdowns began. Although the full extent of the damage from Fukushima Daiichi has yet to be determined, the volume of these releases alone shows that we are dealing with something unprecedented in history. I was first alerted to the severity of the Fukushima disaster by Bay Area Indigenous Elder Zachary RunningWolf. A full-time activist and community leader in the Bay Area, RunningWolf has long campaigned for racial and environmental justice in a myriad of ways. In 2001, RunningWolf ran thousands of miles across the country for political prisoner and journalist Mumia Abu-Jamal’s freedom, from San Francisco all the way to Philadelphia. From 2006-2008, he led the longest urban tree-sit in history to prevent UC Berkeley from cutting down the Memorial Oak Grove to expand its football stadium on an Ohlone burial site. Journalist and Political Prisoner Mumia Abu-Jamal has been incarcerated for over three decades despite long-standing evidence that he was falsely convicted as a target of extensive institutional racism. Other scientific organizations such as the Nordic Probabilistic Safety Assessment Group have gone even further. This institution – which is by no means “anti-nuclear” as it was founded by the nuclear utilities of Finland and Sweden – predicted in 2011 based on official estimates of radioactivity released into the Pacific that around 50-100 million fish would die from just one of the most deadly and prolific isotopes which had been released. And indeed, such mass deaths started to occur in the summer of 2011, when the largest series of unprecedented die-offs of marine life ever began in the northern Pacific Ocean. On the West Coast, the first event was observed in August of 2011, when the radiation was still solely a consequence of unevenly distributed airborne fallout. By 2015, it was known that “hundreds of millions” of sea stars had died. The populations of approximately 20 sea star species had been decimated, many of which are keystone species that play an essential role in ensuring the health of their ecosystems. In 2013, record numbers of sick sea lion pups were declared a “crisis of epic proportions” by the National Marine Foundation, and record numbers continued in 2014 and 2015 with sea lion deaths “unprecedented in scale,” which were still not declining even in August of 2016. Other marine mammals such as whales also had unprecedented die-offs, with record numbers of dead baleen and humpback whales reported in 2013, 2015 and 2017, while surges in marine mammal strandings for large numbers of otters and dolphins have been reported as well. In 2013, chinook salmon returns were at a “record low”; in 2014 the declines of salmon, herring, cod, halibut and pollock amounted to a 90 percent die-off, worse than anything ever seen by lifelong fishers; by 2015 sardines and crayfish had “pretty much disappeared from the Pacific Ocean” and “vanished from California waters,” with forage fish, like herring, having declined by 98 percent or more, while the anchovy population had “truly collapsed” and 13 million salmon had “just disappeared.” Even into 2017, the “unprecedented fisheries collapse” of chinook salmon was still ongoing. Further north, nearly a dozen Indigenous tribes are partners of the Salish Sea Marine Survival Project, which has been investigating the relationship between plankton depopulation and the salmon die-offs, while the Alaska Native Tribal Health Consortium set up a network for reporting mortality and disease events in Pacific marine life. These are just some of the many Indigenous communities affected by and working to protect the health of the Pacific Ocean and all the life that depends on it. As aboriginal advocates have argued, the violence of nuclear contamination in desecrating their lands and culture must be recognized as a kind of cultural genocide. As the Caretakers of Mother Earth have warned, the nuclear establishment has been working tirelessly to cover up and downplay the consequences of this nuclear disaster. The University of California has long played an essential role in this establishment, as it designed the core physical package of every single nuclear warhead in the U.S. arsenal. And now, formerly secret documents show that UC played an indispensable role in the federal response to – and cover-up of – the Fukushima nuclear disaster. Far from being incidentally related to the case, the University of California’s Lawrence Livermore National Lab (LLNL) was in fact the federal contractor given the responsibility of projecting the damage or “dose” from Fukushima Daiichi’s fallout to Japan, the Pacific Ocean and U.S.-occupied Turtle Island. The estimates secretly forecasted by the LLNL’s model predicted very high doses to children in California from radioactive iodine, which is known to cause serious thyroid illnesses. 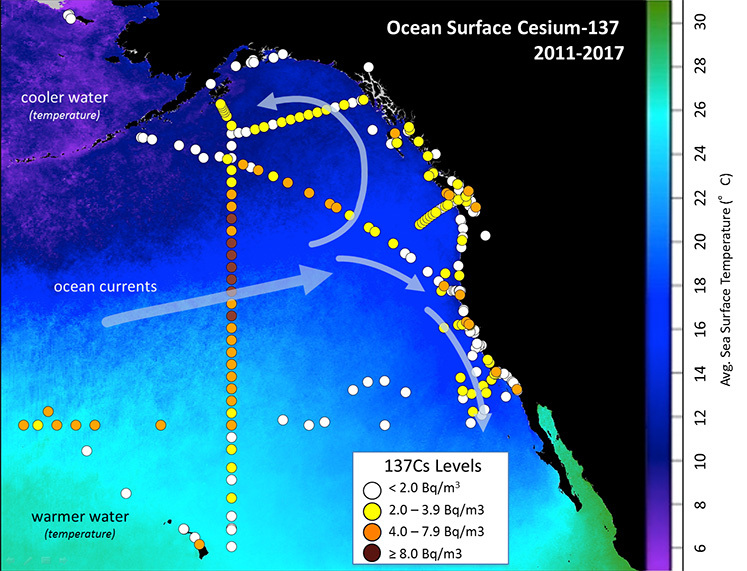 Subsequent measurements found that this model’s predictions of radiation exposure in California were far more accurate than lower estimates and actually underestimated the radiation found 30 km off the coast of Japan. This is the U.S. government agency National Oceanic and Atmospheric Administration (NOAA) HYSPLIT Model of the plume of airborne radiation (cesium-137) from Fukushima Daiichi. Even worse was the initial UC Berkeley claim that the radiation reaching California was “not harmful at all” and posed “no risk to California,” despite the LLNL’s forecast of very high doses to children in California from radioactive iodine. When UC Berkeley began testing for radioactive iodine from the Fukushima fallout in California, it found levels in rainwater up to 181 times the EPA’s safe drinking water standards. And although rainwater and tap water should not be conflated, radioactive isotopes climb their way up the food chain in increasing concentrations in numerous ways, such as the soil of produce farms and the pastures of milk-giving cattle. And, indeed, radioactive materials from Fukushima were detected across California’s food web, while UC Berkeley’s own measurements showed that food items such as milk were regularly exceeding the EPA’s PAGs in both 2011 and 2012 until they stopped taking these measurements. The response to these findings was once again denial and distortion. The EPA soon increased its PAG “safe limit” by more than 400 times, to such a high level that all of these findings would retroactively cease to be considered health risks. In the meantime, UC Berkeley engineers once again asserted there was no cause to worry and falsely minimized these readings by conflating external radiation as received from plane travel with the more dangerous internal radiation received through ingesting radioactive particles, which remain in the body emitting radiation for much longer and have the ability to concentrate in specific vulnerable organs such as the thyroid. But the initial epidemiological evidence is in, and it already shows a variety of illnesses and deaths across the West Coast significantly correlated with the arrival and presence of Fukushima fallout, such as over 100 additional fetal deaths and birth abnormalities in the state of Washington in 2011 and increased rates of congenital hyperthyroidism in California infants born shortly after the meltdowns – around 1,500 additional borderline and severe cases. The EPA soon increased its PAG “safe limit” by more than 400 times, to such a high level that all of these findings would retroactively cease to be considered health risks. The University of California totally failed to make public the initial LLNL projections of “very high doses” to California infants and provide adequate health warnings – such as avoiding contaminated milk or taking natural iodine supplements – despite having this legal responsibility both as a federal contractor and as the operator of California’s Poison Control System, which administers such warnings on behalf of the California Emergency Medical Services Authority for the entire state. As serious as the consequences of the fallout on California were, the radiation California and the West Coast received was only a small fraction (<2 percent) of the total, of which the majority (~80 percent) fell into the Pacific. From the very beginning, UC scientists were involved in studying the Pacific die-offs. Indeed, it was UC scientists who declared when studying the 2011 marine invertebrate mass die-offs that “[N]o previously documented mortality event has been so severe over such a large region …” Yet these UC scientists who had been studying this epidemic from the very beginning have failed to ever monitor the sick and dead animals for radiation, despite one of the lead scientists admitting that Fukushima could not be ruled out as a cause. When their major study was published in 2018, it included no consideration of Fukushima or radiation whatsoever. Apparently, it was a moot point – the UC’s website on the die-offs had already been claiming for years there was “no evidence” of Fukushima radiation having an impact, even though they had never looked for any despite having already admitted it couldn’t be ruled out. To make matters worse, one of the principal UC authors of this study falsely claimed that Fukushima radiation could not have precipitated the die-off, because “many more creatures would be affected.” By this time, the unprecedented and concurrent die-offs of fish, marine mammals and sea birds had already been reported. This is due to a variety of reasons, including the flow of currents and the role played by sediment and debris in transporting radiation. Furthermore, studies have shown that the bioconcentration of radioactive particles up the food chain increasingly amplifies its prevalence in smaller and larger marine organisms by factors ranging from 3 to 300. While this memo may have previously been secret, the “no threshold” model of radiation has been well-established for almost as long, and is the accepted foundation of radiation protection for the Environmental Protection Agency, National Academy of Sciences, and many other institutions. In the 1960s, UC Berkeley Nuclear Scientist John Gofman established the Biomedical Research Division of the UC’s LLNL, when he was employed by the AEC to discredit findings which showed that “low level” radiation from nuclear weapons tests was exposing infants in surrounding areas to dangerous amounts of radiation. Instead, Gofman’s research confirmed these dangers, and at the end of the decade he gave a report showing that there is no threshold beneath which radiation exposure is “safe”: lower levels correspond to a lower – b­ut very real – risk of disease. Consequently, dilution does nothing more than spread the impact of radiation amongst a larger population vulnerable to disease, with each individual facing a lower risk but the overall aggregate impact remaining the same. The AEC disliked these findings and forced Gofman out of the LLNL, illustrating the reprisals nuclear scientists often face for challenging the pro-nuclear establishment. This model was published by G.J. Han et al in the August 2013 edition of Science China Earth Sciences, projecting the increasing concentration of radioactive pollution off the West Coast in the first two years after the Fukushima catastrophe. Numerous projections of the spread of Fukushima radiation in the Pacific Ocean have predicted that, far from becoming increasingly diluted, once the radiation leaves the immediate vicinity of the Fukushima shoreline it would actually become increasingly concentrated as it approaches the West Coast due to the dynamics of ocean currents, with eventual peak concentrations reaching levels up to 10 times higher than off the coast of the rest of Japan. There is no threshold beneath which radiation exposure is “safe”: lower levels correspond to a lower – b­ut very real – risk of disease. What measurements are available not only confirm these projections, showing increasing concentrations traveling east across the Pacific Ocean roughly correlating to these models, they also show that the vast quantities of radioactive particles the Nordic PSA Group predicted would kill at least 50-100 million fish were indeed present throughout large areas of the Pacific Ocean. Once again, these denials have serious consequences not just in terms of the ecocidal impact of Fukushima Daiichi’s radiation on Pacific sea life. Based on the thoroughly disproven dilution fallacy, several prominent UC scientists have also denied that there are any health impacts from Fukushima radiation in the Pacific, including the risks entailed in eating contaminated seafood. As predictions of mass die-offs and increasingly concentrated radiation crossing the Pacific to the West Coast have already come true, ignoring the scientific evidence about the dangers this radiation poses to us too promises to have deadly consequences. With over 1 hundred million sea creatures having already perished as predicted by the nuclear utility-founded Nordic PSA Group, this institution’s estimate that more than 1 million people could also die if human consumption of Pacific seafood continues unabated is supported by a solid track record based on the scientific method, unlike the UC’s ongoing denials and distortions of even the most basic facts of the Fukushima disaster. Further illustrating the international stakes and genocidal consequences of the UC cover-up is the role the university has played in Japan, where approximately 18 percent of the radioactive fallout landed. Once again, the UC failed to warn the Japanese people of how serious the dangers posed by Fukushima’s fallout were, even as its secret model indicated the need to evacuate Tokyo, the largest metropolitan area in the world. This recommendation was subsequently given by others such as Dr. Shigeru Mita, a physician who relocated his practice from Tokyo after observing symptoms of radiation sickness since 2011, and advises that inhabitants should leave the city due to the health consequences of the radiation there. With over 1 hundred million sea creatures having already perished as predicted by the nuclear utility-founded Nordic PSA Group, this institution’s estimate that more than 1 million people could also die if human consumption of Pacific seafood continues unabated is supported by a solid track record based on the scientific method, unlike the UC’s ongoing denials and distortions of even the most basic facts of the Fukushima disaster. Leukemia incidence more than doubling in Fukushima and several neighboring prefectures, with a 42 percent overall increase for Japan. Backing up this epidemiological evidence is extensive radiation measurement, including one study which found that every one of its soil samples taken from a variety of places in Tokyo were so toxic that they would all be legally treated as radioactive waste by the U.S. government. And yet once again, the UC is at the forefront of denying that there are any serious health risks for the Japanese population, even for those with the greatest exposure still living in Fukushima. Not mentioned by either party was the epidemic increase of disease or the protests this Japanese Ministry has continuously faced in Fukushima for forcing residents to accept toxic radioactive soil repurposed for developing farmland and constructing roads. Evacuees are now being forced to return to Fukushima, despite radiation levels in their homelands measured at up to 100x the international legal limit. One study … found that every one of its soil samples taken from a variety of places in Tokyo were so toxic that they would all be legally treated as radioactive waste by the U.S. government. The report ends with a celebration of “the arc of Los Alamos’s history with Japan” as being “truly awesome,” neglecting entirely to mention the central role this UC lab played in committing genocide against the Japanese people with the nuclear bombing of Hiroshima and Nagasaki. Hundreds of thousands of civilians were killed then by UC-designed nuclear weapons. Today, the UC is once again playing a central role in denying and covering up the deadly effects of the Fukushima nuclear disaster, which continues today as yet another genocide. Although UC Berkeley was recently ranked the “No. 1 public university” by US News in 2018, corporate media refuses to recognize how it has served as the foremost academic partner of the largest military empire in history. This shameful reality is a manifestation of the twisted vision outlined in Dr. Gray Brechin’s “Imperial San Francisco,” which describes in detail how the white supremacist founders of UC Berkeley envisioned it playing a pivotal role in extending American Empire, with the construction of Berkeley’s nuclear laboratory as the crowning fixture of its “annexation” of the Pacific. As the U.S. military occupation of Japan continues to this day – with tens of thousands of soldiers and several bases still stationed in the country – the imperial and colonial dimension of the Fukushima disaster cannot be ignored. Fukushima Daiichi’s fuel was supplied by uranium forcibly extracted from aboriginal peoples’ land by permission of the Australian government. Although UC Berkeley was recently ranked the “No. 1 public university” by US News in 2018, corporate media refuses to recognize how it has served as the foremost academic partner of the largest military empire in history. And today, pressure from the U.S. government has played an important role in the Japanese government’s involvement in the cover-up, including legislation recently passed in Japan which criminalizes sharing epidemiological data and reporting or whistleblowing on the “state secrets” of the Fukushima disaster. Meanwhile, in the Bay Area, a similar crackdown and criminalization of whistleblowing has suppressed the campaign to provide real health warnings and solutions, and to hold the UC accountable for the ecocidal and genocidal consequences of covering up the Fukushima nuclear disaster. As a volunteer with RunningWolf’s campaign during Berkeley’s 2016 election, I saw firsthand the level of illegal election interference and media censorship he faced in his journey to become this country’s first Indigenous mayor. Of all the candidates, only he pledged to redress the Fukushima nuclear crisis, as well as many other important issues, such as the institutionalized racism of the Berkeley Police Department, the dispossession of the Bay Area’s Native Ohlone peoples, and the billions of dollars the UC Regents continue to invest in the fossil fuel industry to this day. But just before the cycle’s mayoral debates were set to begin, RunningWolf was arrested and incarcerated by the Oakland Police Department for 31 days for participating in a march in solidarity with the then ongoing strikes against prison slavery, as well as for a small amount of cannabis which had been collected six months earlier by the California Highway Patrol. It was only after undertaking a 13-day hunger strike while incarcerated – likely becoming the only electoral candidate in the nation to join the strike in prison – that RunningWolf was finally able to secure his release. Allowed to participate only in Berkeley’s fifth mayoral debate, RunningWolf emphasized in his concluding remarks the importance of addressing the Fukushima nuclear crisis and holding the UC accountable for providing no solutions or health warnings. Ever since, he has been struggling against a complicit media which has refused to cover his story and corrupt local institutions which refuse to address or even investigate this election interference and the violation of not just numerous local and national laws, but many international laws as well. To give just one example, the right to participate in elections free from racial discrimination is guaranteed in Article 5 of the UN Convention on the Elimination of All Forms of Racial Discrimination. This right was explicitly violated when RunningWolf was politically targeted using cannabis strategically withheld for six months to prevent him from participating in the mayoral debates, then incarcerated under a false alias – “Freddie Lee Smith,” a name which he has never used – to distance him from his Indigenous name RunningWolf. The UN Declaration of Indigenous Rights goes even further in establishing the international laws which guarantee the rights of Indigenous people to participate in the political process, especially elders such as RunningWolf. In total, at least 19 articles of this Declaration were violated through the systematic denial of RunningWolf’s legal rights, including the right to equally participate in the mayoral debates, fairly seek employment, have access to non-Indigenous media and, crucially, to protect the environment and livelihood of Indigenous peoples. At a sixth “extra” mayoral debate, RunningWolf was again barred from participating as only city councilmembers – deemed the “presumptive frontrunners” – were allowed to speak. Many recent studies have confirmed what Native peoples have long been teaching, that Indigenous sovereignty is essential to ensuring a healthy relationship with Mother Earth. The protection of the largest body of water on our planet is clearly of the highest importance in this regard. By interfering with the election to keep RunningWolf out of office, local and state police departments have joined the UC in the cover-up of the continued threat Fukushima Daiichi poses through contaminated seafood and the ongoing impacts and leakage of radioactive fallout. As a result, Fukushima Daiichi continues to leak deadly radiation into the Pacific, while RunningWolf is illegally being prevented from working towards a real solution and holding the UC responsible for its genocidal cover-up. RunningWolf, along with nuclear experts such as whistleblower Arnie Gundersen, has long advocated that the first necessary solution is for the Fukushima Daiichi plants to be encased in a concrete sarcophagus like at Chernobyl, along with preparatory measures to prevent further contamination of the surroundings and end the ongoing leakage into the Pacific Ocean. The UC is intimately involved in an ongoing effort which has cost more than $100 million of Japanese tax revenue on a two-pronged effort using the Los Alamos National Laboratory (LANL)’s Muon Imaging Technology alongside expensive robots to find and remove melted fuel from inside the reactors. Yet after nearly eight years, much of this fuel has not yet been located and none of it has been removed, while the radiation continues to leak into the Pacific Ocean every day. And once again, the UC’s priorities are clear, as this “solution” was showcased in the same LANL press release overwhelmingly concerned with “rebuild[ing] public acceptance of nuclear power” and protecting the Japanese nuclear industry, rather than with the impact on public health or the environment. Conversely, RunningWolf’s priorities are first and foremost the health of both the people and the environment, of Mother Earth and all life – for we all depend on her well-being for our survival. The election interference he faced, buttressed by the continued refusal to investigate the violations he has presented, was a criminal violation of international laws including the UN Convention on the Elimination of All Forms of Racial Discrimination and the UN Declaration of Indigenous Rights. But the Berkeley Commission tasked with ensuring the city’s elections are conducted fairly – the Fair Campaign Practices Commission (FCPC) – will not investigate this election interference. And even when the FCPC unanimously concluded that rival candidate Jesse Arreguín had committed 18 campaign finance violations to become the current occupier of the mayor’s seat, Arreguín was let off with no more than a fine. Despite the fact that Arreguín had already been warned in 2016 by the deputy city attorney not to commit the exact violation he went on to commit, 18 more times, the FCPC refuses to enforce the letter of the law. The double standard committed with respect to criminal justice and institutional racism in the treatment of RunningWolf and Arreguín could not be clearer. The criminalization of RunningWolf’s political activism was deliberately timed to prevent him from exercising his legal rights to participate in the electoral process, and the crimes he was accused of in no way could have unfairly affected the results of the election. Conversely, even after Arreguín was found guilty of having committed 18 violations of the election laws designed to ensure that the election is fair, despite being warned, he still has not been arrested or had any criminal proceedings brought against him. In short, Arreguín’s theft of the election is being treated as a harmless mistake, while the illegal criminalization of RunningWolf rigged the election against him from the very start. As the Caretakers of Mother Earth have warned us, the future of all life is at stake in our response to the Fukushima nuclear disaster. The consequences of allowing this illegal election interference and racist double standard to keep RunningWolf out of the mayor’s seat could not be more serious. Harun Minhaj is a freelance writer and volunteered as Blackfeet Elder Zachary RunningWolf’s campaign manager during Berkeley’s 2016 mayoral election. He can be reached at Harun.Minhaj@protonmail.com. Previous articleEnd the gladiator fights! End the separation of families and of fathers from their children! Seems like a lot of fear mongering to me. I’m sure the tsunami washed unprecedented amounts of chemicals and other waste products into the water that may have had an adverse impact on the environment. The actual causes of deaths should be studied and clarified and not speculated and spread without scientific proof. It doesn’t seem logical that radioactive waste could cause such environmental damage. It’s disappointing that this was printed as it stokes unnecessary fear. The fear of radiation caused unnecessary and unwise evacuations of sick and elderly people causing many unnecessary deaths following the tsunami. The fear of nuclear power and radiation is particularly dangerous at this time due to the clear and present threat of global warming. The vilification of nuclear power and fear of radiation by well-meaning, but wrong-headed environmentalists will hasten our doom. Renewables cannot do it alone, we should be building nuclear power plants like our lives depended on it, because they do. We should do so with the drive and determination of the moon shot. Read some of the more well-informed information at Environmental Progress. Many environmentalists are changing their views on nuclear power, rightfully so. Open your minds, educate yourselves, and be more effective environmentalists. Sausalito, CA. Fukushima Daiichi (FD) airborne fallout is directly to blame for Urchin, Starfish, Molusks, native to N. California, population decimations as shown in your article. LLRadLabs are complicit with TEPCO catastrophe denial relating to meltdown Corium clean up. For example Three Mile Island (TMI) meltdown according to IAEA involved 18,000,000 kilograms of meltdown Corium and took 13 years to remove from TMI worksite. FD has 265,000,000. Kilograms of meltdown Corium and using TMI experience as historic meltdown cleanup timeline guideline FD will take 182 years to remove 265,000,000 kilograms meltdown Corium. revealing FD Primary Pressure Vessel Breach leading to Primary Containment Vessel Breach causing TEPCO to construct ice wall. FD Corium has left the building. We can’t wait 182 years to remove and we don’t have the robot powered twist drills to speed up the removal process. TEPCO release your MELT documentary evidence and we will help create solution. Secrets delay and destroy life in all forms. Hey; this information is very good, keep posting and updating the readers.